2008 saw the debut of Robert Pollard's new "band." I say band, because it marked the first time that one of his side-projects hit the ground running with not only a solid LP, but intent to tour. Boston Spaceships was comprised of Pollard, Chris Slusarenko (GBV, The Takeovers), and John Moen (Decemberists). Recorded in Portland, OR, Slusarenko played all the instruments, with Moen on drums. The tracks were then shipped over to Ohio, where Pollard added lyrics and vocal melodies. The debut was met with general critical praise up on its release. 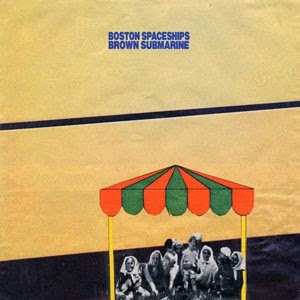 In the midst of some spotty Pollard solo material of the time, and hay-wire side projects, Brown Submarine was a welcomed listen, and is a strong showing all around. Winston’s Atomic Bird- 4 Classic late period GBV shines here. Angular arena rock status, with all the surreal lyricism, and sly hooks of some classic memories from the period, something that had been largely absent from much of the side-project output up until this point. You Satisfy Me- 4 Fairly average verses with great guitar hooks, and ad nauseaum pop ending following said guitar line. A little reminiscent of Isolation Drills material, so again, so refreshing to hear here. North 11 AM- 2 Downwardly morose, plodding song that makes an attempt at the end to pick it up a bit, but ultimately continues on its depressed trek across the grooves. The Weakest track of the album thus far. Psych Threat- 3 Some pretty poor choruses, but man the verses are great. Choruses sound like a annoying Buzzcocks b-side chorus, repeated over and over that kind of kills this from being a classic. Soggy Beavers- 3 Ok. Yes, this song is called “Soggy Beavers.” Can a song loose merit for it’s terrible douche-chilling title? Unfortunately, the song’s not much to write home about either. Easy listening pop, with out-of-tune vocals. Gets catchier with repeated listens, sometimes in a grating way. Ready to Pop­- 4 Bright, and brittle guitars over bouncy Kinks-like basslines. Great, short lazy choruses that stick easily. Pollard’s vocals boarder on the ridiculous in sections, but manages to keep it together. Go for the Exit- 5 The best saved for last. After an album of the most promising side-project tracks in a while, this closer is vintage mid-90s GBV pop that fits snugly on any indie-pop mix-tape, Pollard related or otherwise. Zero Fix is a 4 - minimum! Really appreciate what you've done here chief. North 11 AM...what the hell is this song about? Kinda like it though. Yeah, I'd give Zero Fix a higher ranking.